In honor of the concert that Amy, our friend Tracy, and I will be attending tonight, I’ve chosen Chris Tomlin as today’s Friday Favorite. We’re headed up to Denver to the Wells Fargo Theater with our front row tickets to enjoy a little love from his Hello Love album! Now Amy, Tracy, and I all went to see Chris back in early 2008–long before Amy I were roommates–when he was on the How Great Is Our God tour with Louie Giglio (another one of my faves!). But that time we got to the church a little late, and the seats weren’t reserved by ticket, so we ended up sitting in the nose-bleed section. Tonight we’ll be able to tell if Chris has a drop of sweat on his nose! Looking forward to it. Of course Amy used some of her mad-skills and got us backstage passes, and we got to meet Chris and Louie. Amazing night all around. Hoping this night will be just as great! Love Chris’s worship songs. I always leave his concerts feeling like I’m stepping out of a church service. 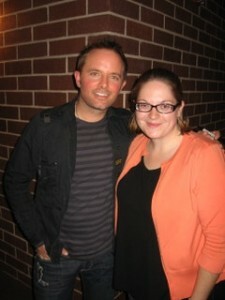 Me and Chris Tomlin - likely one of the worst pics of me ever! So I’ve come to a quandry. As we all know by now, Brandon Heath is one of my favorites. And Third Day is also near the top of my list. (Hmmm … I should nominate them for a Friday Favorite slot.) I’ve had the opportunity to see both Brandon and Third Day in concert on seperate occassions this past year. Both were delightful shows. Imagine my delight when I learned that they’re going on tour together this spring for the Revelation Tour. What could be better? I scurried to see the tour schedule to see when they’d be arriving in Colorado. But with each date in the list, my heart sank a little lower. Each date a disappointment. The east coast. The Midwest. Texas. California. Canada. No Colorado. Not even a date in New Mexico. But there … off in the distance … a glimmer of hope. The tour is coming to Phoenix, Arizona, a mere 15 hour drive. To the little Celebrity Theater with the spinning stage. The site of my first post-college concert–Chris Tomlin and Louie Giglio. Okay, so I wouldn’t really drive it, but I have been seriously thinking about flying down for a long weekend and spending a couple days with my family, who live only about a 3 hour drive away. But is it worth it? To plop down $175 for a plane ticket and another $35ish for a concert ticket? My mom laughed at me when I suggested it. But I haven’t written off the idea yet.